Side Banner Ads are located on the upper right of the page with up to 4 ads shown at the same time (see image below). These 4 ads are randomly picked from a group of ads with width of 300 pixels and height from 175 pixels to 250 pixels, including third party ad codes. 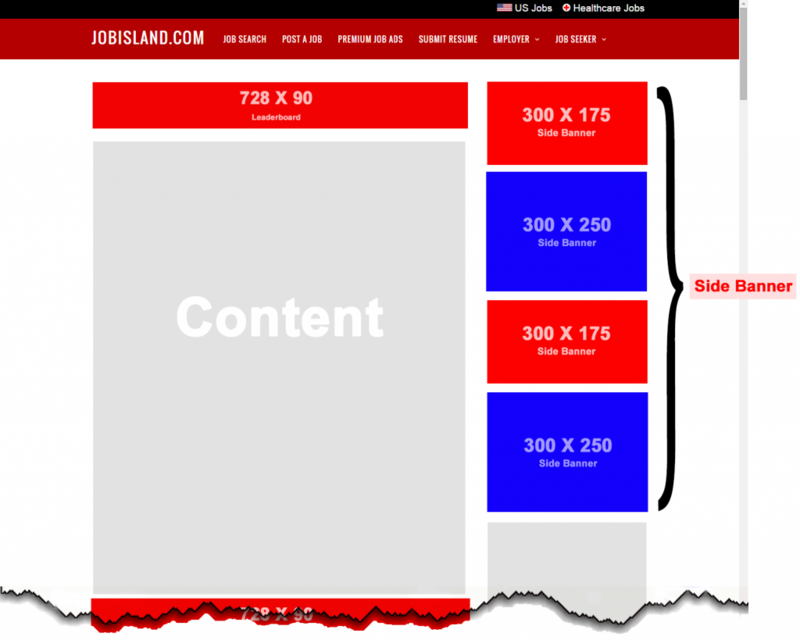 All banner ads will be hosted on JOBISLAND.com and all image uploaded to our server will pass our image optimizer. NOTE: You will be billed monthly using PayPal Subscription until you cancel your subscription. Please use PayPal if you wish to cancel your subscription. We will send you a confirmation once your Ad is set. If you have any questions or custom requirements please feel free to Contact Us.